Provide your daylilies and other flowers a fantastic growing environment with the Panacea Circular Plant Support. Using a support stake helps your plants grow upward, so they can form a robust root system. The 8" diameter, top ring on this piece gathers your spreading flowers, and its innovative latch allows you to open and close the ring as needed. Its 36" long stake inserts into soil easily, while the metal construction adds strength. The green color blends with your garden, and the versatile design may be used for a wealth of flowers or vegetables. 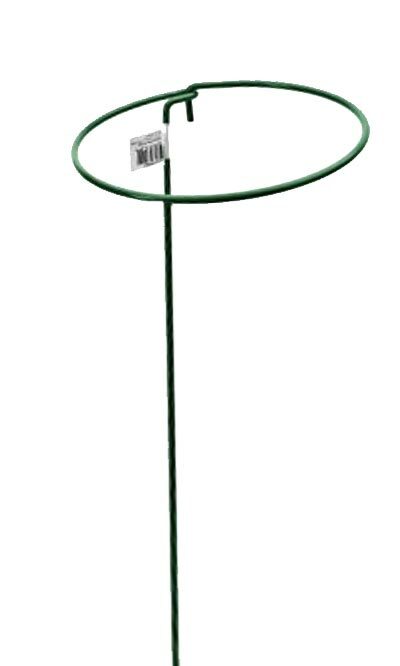 Ensure your favorite plant grows beautifully upright with this Circular Plant Support. Note: This case pack includes 24 of the Panacea Circular Plant Supports, 8" x 36".